Once you try noise cancelling headphones, it’s hard to go back. However, over-ear noise cancelling headphones can be bulky and difficult to carry around, especially if you’re always on-the-go. There are a few noise cancelling earbuds on the market that isolate just as well yet are far more portable. 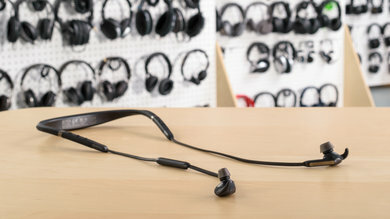 Headphones with active noise cancellation (ANC) tend to be able to block out more noise than those that isolate passively, but they can be pricey. Thankfully, there are a couple of in-ear models that have great passive isolation too and are less expensive than their ANC counterparts. We’ve tested 337 headphones and below are our recommendations for the best wireless noise cancelling earbuds in 2019. If you’re looking for our top picks for other noise cancelling headphones, check out our recommendations for the best noise cancelling headphones, the best budget noise cancelling headphones, and the best on-ear noise cancelling headphones. The best wireless noise cancelling earbuds we’ve tested so far are the Bose QuietControl 30. 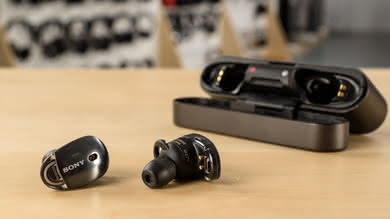 They have an understated yet fairly premium look with a comfortable earbud fit that causes less fatigue over time than more traditional in-ear. They have a wireless neckband design that you can keep on you all day, and they’re easy to use. The Bose QuietControl 30 have a fairly neutral, well-balanced sound that’s suitable for various music genres. Their 11.4-hour battery life is decent and they have an auto-off timer that can be accessed via the Bose Connect app to further save power. The QC 30 have impressive isolation performance, and their active noise cancelling feature is very good. They isolate well in the bass, mid, and treble ranges, which makes them good travel headphones and a solid choice for office use as well. 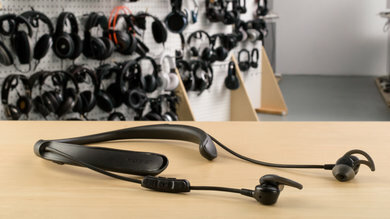 Although they look and feel like high-end headphones, the QuietControl 30 have issues with the rubber sleeve that covers the neckband peeling off. Although this issue is mostly cosmetic in nature, it can affect the functionality of the headphones if the coating of the in-line remote begins to come off too. Not all units have this issue, but it seems to be a fairly widespread problem, which is disappointing at this price point. However, the Bose QuietControl 30 are still the top performing noise-cancelling earbuds we’ve reviewed to date and are likely to satisfy those looking for good travel earbuds. If you’re looking noise cancelling earbuds that you can customize from your smartphone, get the Sony WI-1000X. They’re not as comfortable as the Bose QuietControl 30, but they’re compatible with the Sony | Headphones Connect app that gives you access to a whole bunch of customizable features, like a graphic EQ with presets, room effects, and ANC control. Compared to the Bose QuietControl 30, the Sony WI-1000X don’t have as good of a battery. They provide only about 10 hours of continuous wireless playback and take a whopping 3 hours to charge. That said, they can be used completely passively with their included audio cable without ANC once their battery dies, which is quite rare for wireless in-ear headphones. All in all, the Sony WI-1000X are decent wireless noise cancelling in-ears, especially if you prefer more customizability than what the QuietControl 30 have to offer. If you’re looking for comfortable wireless noise cancelling earbuds with a convenient neckband design but find the Bose QuietControl 30 too expensive, get the Jabra Elite 65e; they're the best Bluetooth noise cancelling earbuds in the mid-range category. They don’t isolate quite as much noise as the QC 30, but they feel like better-built headphones and may provide better value overall for some. The Jabra Elite 65e have a deep, bass-heavy sound that fans of bass are sure to love and are well-suited to rap, hip-hop, EDM, or dubstep thanks to their powerful thump and rumble. They’re less suitable for more vocal-centric genres of music straight of the box, but thankfully they’re compatible with the Jabra Sound+ app which provides a 5-band EQ for you to find your ideal sound. They isolate well overall and have a surprisingly decent microphone for Bluetooth headphones, which is an added bonus. 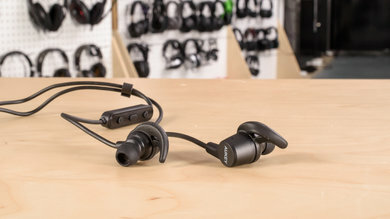 Like the Sony WI-1000X, the Jabra Elite 65e don’t have as good of a battery as the QC 30; they provide 8.5 hours of continuous wireless playback and charge in about 2 hours. However, you can use them while charging, which is great if you’re close to a power outlet at work or at home. 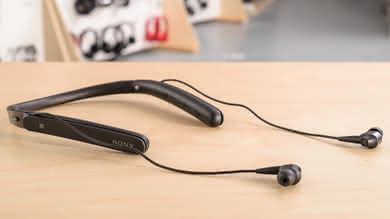 If you want noise cancelling earbuds but aren’t a fan of the neckband design of most ANC models, get the Sony WF-1000X. They don’t isolate noise as well as the Jabra Elite 65e, but they have a much more portable truly wireless design. They’re well-built and come with a premium metal charging case that makes them feel like high-end headphones. They have great audio reproduction and support NFC for easier mobile pairing. Unfortunately, they have one of the worst latency performances we’ve seen so far at 400 ms of Bluetooth latency. This means they’re not suitable for watching videos or playing mobile games since what you hear won’t match what you see. They also have a sub-par 3-hour continuous battery life. Their charging case provides two additional charges so they can last up to 9 hours in total if you take breaks to charge them in their case, but this isn’t as much as other truly wireless headphones like the passively isolating Anker SoundCore Liberty Air. If you’re on a budget and don’t mind if your earbuds don’t have ANC, as long as they block out a reasonable amount of sound, get the AUKEY Latitude. These entry-level wireless in-ears aren’t as well-built as the Jabra Elite 65e, but they provide great value for their price, especially if you don’t need ANC. 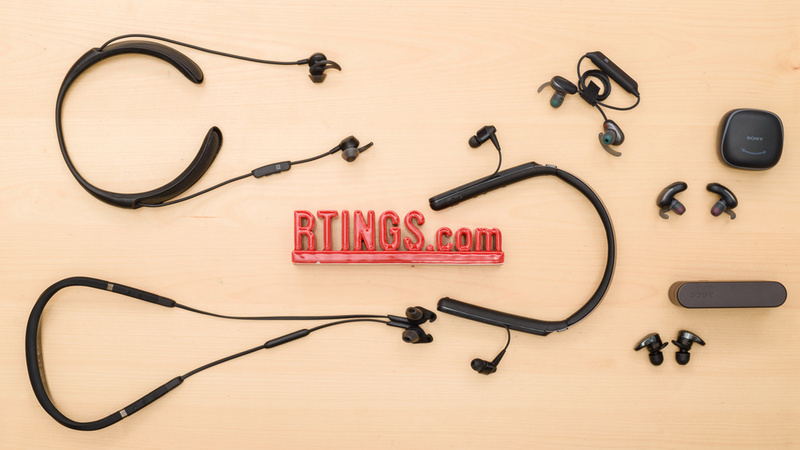 They’re portable, lightweight in-ears that have an easy-to-use in-line remote and a stable fit that’s great for sports. The AUKEY Latitude isolate very well and manage to passively block out a lot of noise. They also have outstanding leakage performance, which means that you can raise your listening volume to mask out even more sound without having to worry about bothering those around you. Their default latency is lower than that of most Bluetooth headphones at 162 ms, which is great. They even support aptX (LL), which means that they can achieve even lower latency performance with the right adapter, which is a great feature at this price point. On the downside, the AUKEY Latitude aren’t the most comfortable in-ears we’ve tested. They protrude quite deeply into the ear canal which isolates a lot of noise but can cause fatigue over time. They can sound a bit muddy and cluttered and they aren’t compatible with a companion app that would let you EQ their sound. Their 7.3-hour battery life also isn’t the greatest, but they’re a fraction of the price of the ANC recommendations on this list and provide great value overall. If you’re looking for portable headphones that have not only great passive isolation but great audio reproduction too, get the JBL Endurance Sprint. They don’t isolate quite as well as the AUKEY Latitude, but they sound better overall. The JBL Endurance Sprint have a more neutral sound that delivers a lot of thump and rumble while remaining balanced enough to be suitable for all genres of music as well as podcasts and audiobooks. The JBL Endurance Sprint have a touch-sensitive control scheme that’s fairly intuitive but is, unfortunately, rather challenging to use correctly. 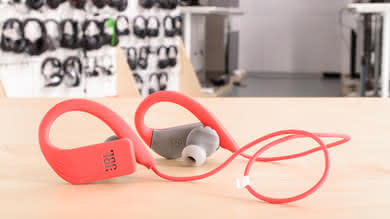 The Sprint are also bulkier than other in-ear headphones with an ear-hook design, like the Anker SoundBuds Curve. The Curve don’t isolate as well nor do they sound as good as the Endurance Sprint, though. Overall, the Sprint are satisfactory headphones. Our recommendations above are what we think are currently the best Bluetooth noise cancelling earbuds to buy for most people in each price range. We factor in the price (cheaper headphones win over pricier ones if the difference isn't worth it), feedback from our visitors, and availability (no headphones that are difficult to find or almost out of stock everywhere). If you would like to choose for yourself, here is the list of all our reviews for wireless noise cancelling earbuds. Be careful not to get caught up in the details. There are no perfect headphones. Personal taste, preference, and listening habits will matter more in your selection.